Lore: Must be Special Summoned (from your hand or among your banished cards) by Tributing monsters from your field (min. 1) and/or Extra Deck (max. 2) whose total ATK is higher than your current LP + 2000. 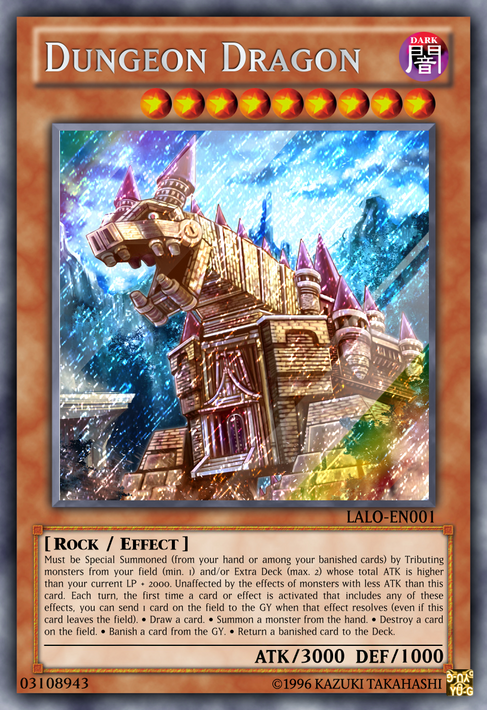 Unaffected by the effects of monsters with less ATK than this card. Each turn, the first time a card or effect is activated that includes any of these effects, you can send 1 card on the field to the GY when that effect resolves (even if this card leaves the field). • Draw a card. • Summon a monster from the hand. • Destroy a card on the field. • Banish a card from the GY. • Return a banished card to the Deck. oh and no, this card is not born from a satanic ritual like the game it was based on no matter how loudly your opponent invokes Satan's nemesis when it pops onto the board keep your hats on folks. Jokes about very tragic and terridumb theories on RPGs aside, this card was something I made in reference to how one would imagine a fight against a final D&D boss would go-something that demands highpower monsters step aside for its birth, protects itself from the opponent's monster trickery, and punished most every route the opponent went to get around it. So one has to go out of the way to get rid of this in a way that DOESN'T lose you your board. So, until the next card? Reviews, revelry, you know the drill.